Introducing the long awaited Yamaha Super Pump Cone. As soon as we released the Kawasaki Super Pump Cone Yamaha owners started calling asking if we would design a similar part for the Yamaha, so we did. Offering the same performance benefits as our Kawasaki Super Pump Cone our Yamaha version will transform your inefficient OEM pump into a high performance large diameter hub race pump. We have incorporated the new design features of our Kawasaki Super Pump Cone "Pro" into this part as well as one more outstanding feature. It is not necessary to run a large hub impeller, so there is no need to purchase a new impeller to benefit from our Yamaha Super Pump Cone. 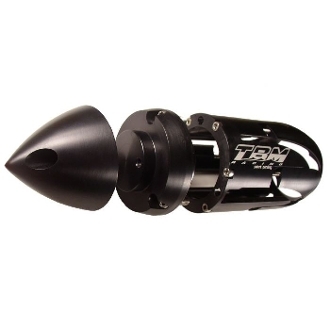 We have designed our Yamaha Super Pump Cone to accommodate any diameter hub impeller. An OEM, standard aftermarket, or C-75 Magnum impeller will work with this set up. Three sizes of our interchangeable tail cone tips are included with this kit. Outstanding for racing, freestyle, or freeride applications. The Yamaha Super Pump Cone will work on any year Yamaha Super Jet, Wave Blaster, or other Yamaha models that utilize the 144mm pump housing.